We love collecting and highlighting cool or interesting little innovations that fall into the “gizmo” folder. This remote operated racing mark definitely falls into that category. The racers in the house know the lousy feeling of being in a starting sequence and feeling a decisive wind shift that will totally undermine how the race was meant to be sailed. Moving around marks can be arduous and we’ve all heard the PRO over the radio try to make the best of shifty conditions with the crew on the mark-set boat struggling to accommodate. But alas, technology has brought with it an alternative – MarkSetBot! It’s essentially an orange racing mark strapped to a dinghy with a radio-controlled electric motor but it’s obviously more than that. This interesting solution to a problem allows the user to control the mark with a mobile app so if it needs to move a few feet in any direction it can be done from the perch of the committee boat or a nearby RIB. According to the developers, it uses GPS technology to zero in on a specific location and remain there until told to move. A course can be set by pointing the connected phone at the wind or by using add-on wind instruments to research trends and then set the bearing based on that info. 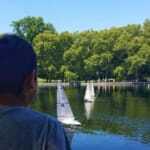 The plan is to use the MarkSetBot for the Great Lakes Boating Festival at Michigan’s Grosse Pointe Yacht Club (GPYC) on May 20 and see if it’s a winner. Our hats are off to them for going to the trouble – seems like a cool idea. 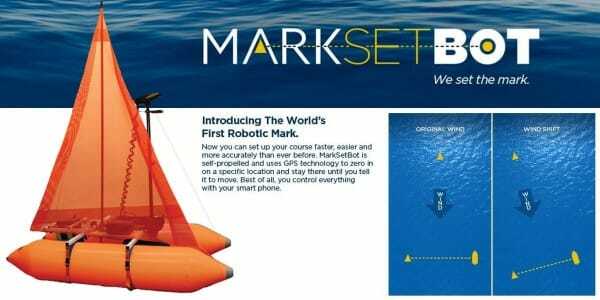 For more information about MarkSetBot, visit www.MarkSetBot.com or find us on Facebook.